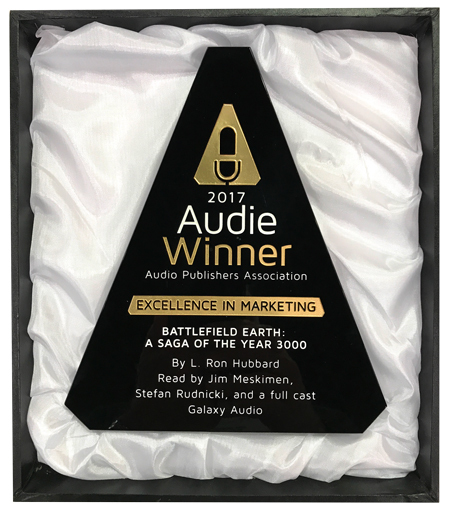 L. Ron Hubbard’s Battlefield Earth audiobook just won an Audie Award for Excellence in Marketing, culminating a year-long progression of recognitions from its successful release last June where it topped bestseller lists. The 47-hour, full-cast audiobook for the bestselling novel Battlefield Earth was announced as an Audie Award winner, the highest honor bestowed by the Audio Publishers Association (APA). 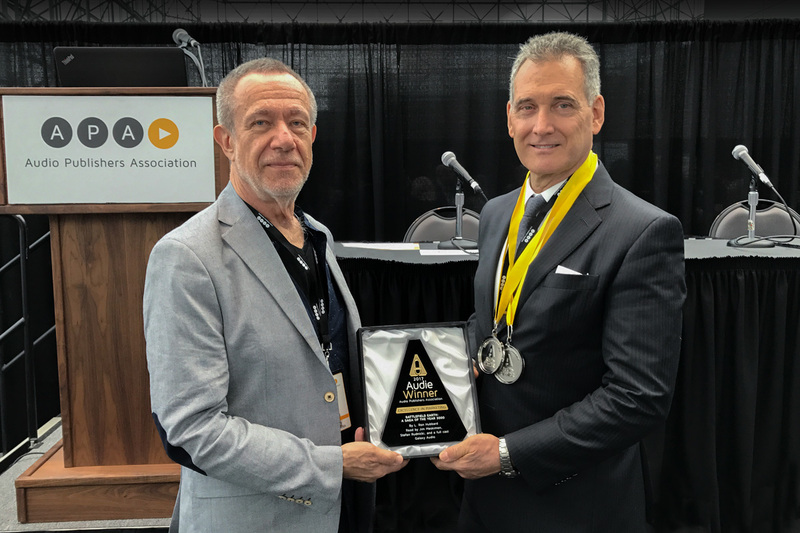 The award presentation was held at the Audio Publishers Association Conference, Wednesday, May 31, at the Javits Center in New York City. The presenter, Grammy award-winning artist Stefan Rudnicki, was pleasantly surprised when opening the envelope as he narrated the author’s introduction to Battlefield Earth for this production. 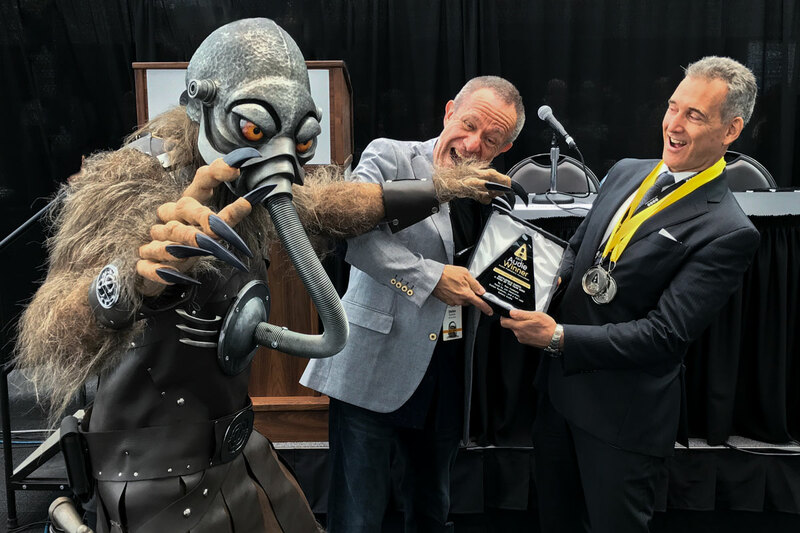 However, just as John Goodwin, President and publisher of Galaxy Press, walked up to receive the award, Terl stormed the stage and grabbed the award, proclaiming it his, and ran off with it. Bystanders stated they heard him muttering something about “leverage” and “gold” as he made his escape. The Audie Awards competition is the only awards program in the United States devoted entirely to recognizing distinction in audiobooks and spoken word entertainment. The committee administers and ensures the integrity of the competition, coordinating the work of over 200 dedicated judges. “A lot of work by hundreds of people went into this production and we had some of the best names in audiobooks, television, film and video games on this project. The story by L. Ron Hubbard is what really makes this audiobook so great, combined with all the amazing talent and team that put it all together,” said Goodwin. Upon its release last year, the Battlefield Earth audiobook hit the #1 spot for audiobooks in the US, received an Earphones Award and was included in AudioFile Magazine’s Best Audiobooks of 2016 for science fiction. Get more information on Battlefield Earth and L. Ron Hubbard at BattlefieldEarth.com and here on our website at GalaxyPress.com. For the latest news, follow @BE_The_Book on Twitter and BattlefieldEarth on facebook.